Before you can search in TMs you have to make sure that a main TM has been assigned to the document (see Defining the Main TM). To automatically search in TMs when the TU is opened, check the relevant checkbox in the Document options dialog box (see TM Search Options) or in the Automation options dialog box (see Automation Options). 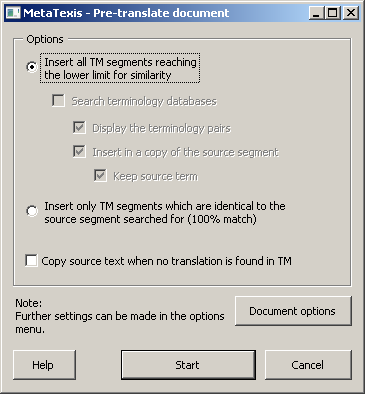 To manually search for a source segment in the TMs specified, execute the menu command: MetaTexis | Translation memory (TM) | Search for source text in TMs (default shortcut: Alt+Ins), or the menu command: MetaTexis | Translation memory (TM) | Search for source text both in TMs and TDBs (default shortcut: Alt+Ctrl+Shift+Ins). This command can only be executed when a TU is opened and the cursor is located in the translation box of the open TU. To search for non-translated segments in a document until the next fuzzy match (less than 100% hit), execute the menu command: MetaTexis | Translation memory (TM) | Pre-translate until next fuzzy match (default shortcut: Alt+Shift+R). This command can save a lot of navigation time when there are a lot of 100% matches. Moreover, you have the guarantee that you do not miss any internal leverage effect. If you work on each fuzzy match immediately and go on only after the translation of the TU concerned is finished, and if the translation is saved in the TM (either manually or automatically), you can take full advantage of all leverage effects. Basically, this function is identical to the Go-to function, but there is an important difference: The pre-translate-until function does not execute the quality check functions (see Quality Control).